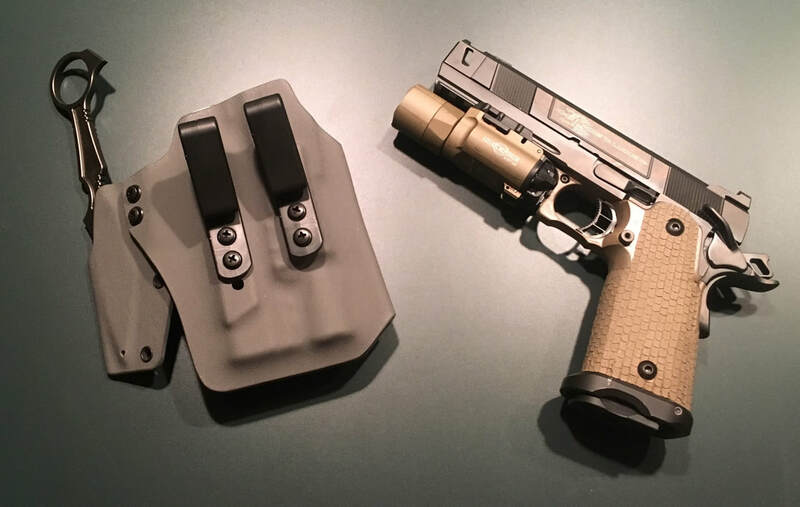 Back at SHOT Show 2016, while wandering among all the new products, I stopped by the STI International booth and handled a new pistol that they were introducing: The Costa Carry Comp. It was a neat gun, good balance and feel, but, at a $3000+ price tag, it wasn’t something that I foresaw being able to purchase. Flash forward a couple of years and circumstances came together and I found myself in a position to acquire not only a Costa Carry Comp, but also an STI Costa VIP. For those unfamiliar with these pistols, both are double stack 1911 style semi-autos from STI’s 2011 line. Both were designed and spec’d with input from Chris Costa of Costa Ludus. The Carry Comp is a full length framed pistol, sporting a 4.15” barrel with an integral compensator (for an overall length of 5”). The VIP is a double stack frame cut to Officer’s dimensions with a 4.15” barreled upper. Both guns are available in 9mm or .45 ACP; I chose 9mm for mine. In the weeks leading up to the purchase, I researched both guns online to make sure I knew what I was getting into. The guns were nice but did they run? Overall, reviews from several sources were positive. The guns were running reliably and performing well. I was able to run a couple of magazines through a Carry Comp belonging to a buddy at the ShootGTR 4th of July range day and was impressed. One recurring negative comment was that the sights were not regulated on the Carry Comp. The standard front sight on that pistol is a fiber optic, which is not my preference, and I was planning on swapping it out to a tritium front sight anyway so this was not a huge factor for me. I also knew from handling the guns that there were several sharp edges along the trigger guard that would need to be beveled. I placed my order via Lawful Defense, a factory direct STI dealer, for both pistols in early July. I received the Costa Carry Comp about a week after the order and the VIP at the beginning of August. I also ordered several additional magazines from Lawful Defense and from a couple of online vendors. 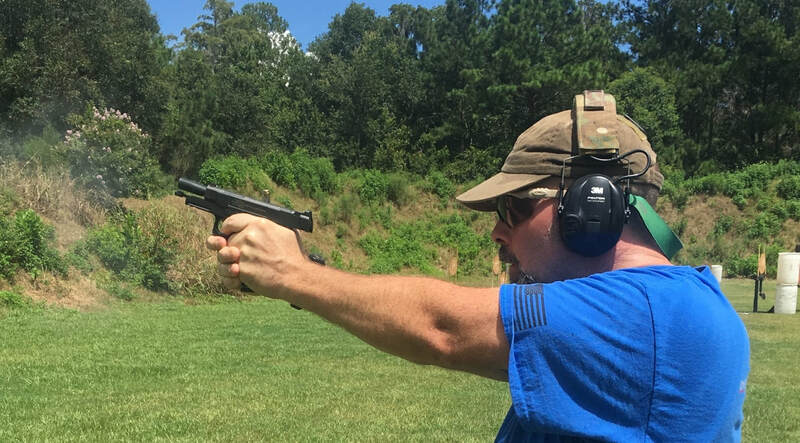 ​Upon receipt of the Carry Comp, I immediately headed to the range to try it. I ran a mixed bag of Federal 115g FMJ and 147g HST. The gun ran smoothly with no issues, with the included mags locking open on the last round. The trigger broke cleanly at approximately 4 pounds, with just a little take-up, which I find desirable in a carry gun. As expected, it shot low, approximately 3” at 10 yards. 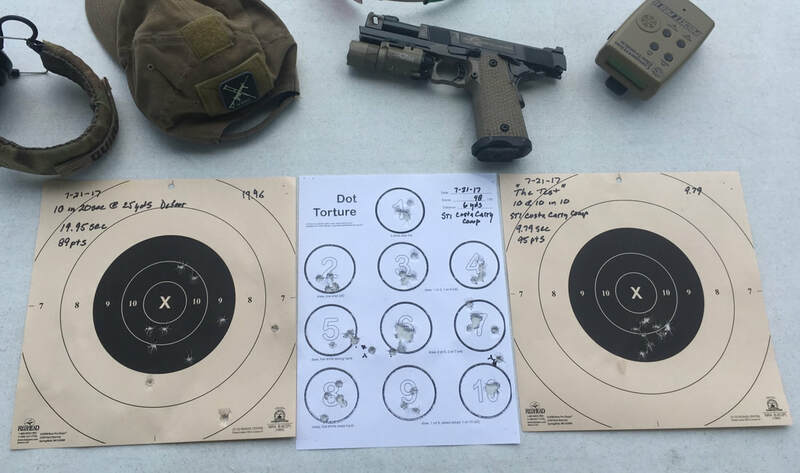 It appears that STI is working to tweak the sight situation with the particular model – my initial reading indicated the guns were shooting approximately 6” low while my buddy’s pistol was around 4-5” low. Over the course of the next two weeks I continued to shoot the pistol, logging just over 500 rounds of FMJ and JHP with no malfunctions. 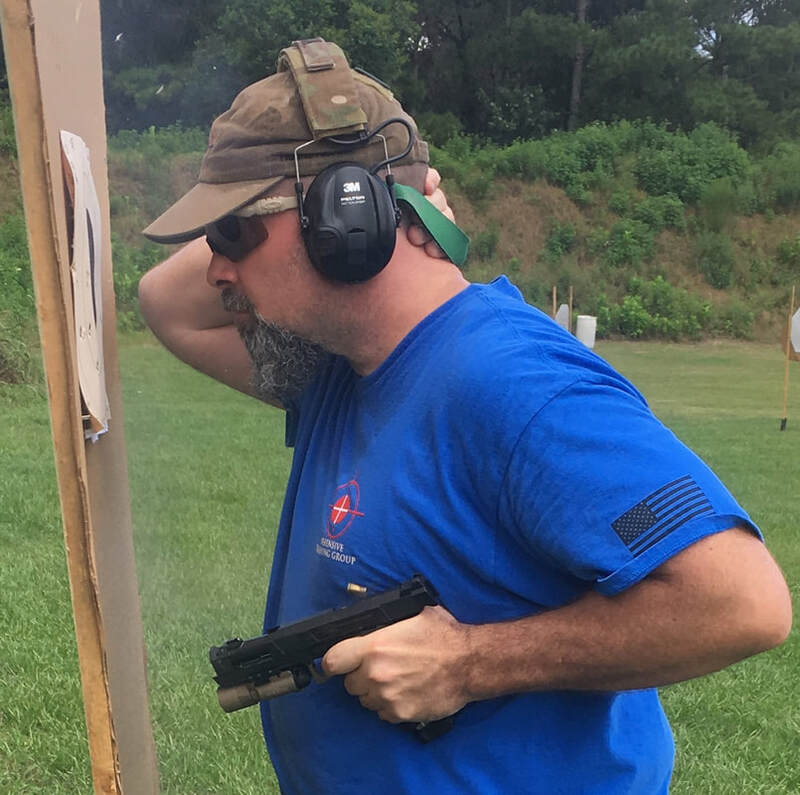 I ran the gun at a Tuesday USPSA match at ShootGTR and found that, as long as I did my part and remembered my hold over, I could easily make solid A zone hits, even at distance. After the initial break in, I used 1000 grit emery cloth to gently bevel and blend the edges around the trigger guard and magazine release and, with the assistance of Robert Wilson of Wizard’s Custom Guns, swapped the .140” Dawson fiber optic front sight for a Dawson .110” front tritium sight. Zero issues aside, fiber optics just don’t work for my eyes in anything but perfect lighting conditions so I prefer a front night sight paired with a plain black rear. ​I also exchanged the STI tactical magazine well that comes with the gun for an STI slim tactical mag well. The standard tactical well works fine and is sufficient for competition or duty use but is rather bulky for concealed carry. As I was planning on carrying this pistol concealed, the slim tactical well offers a fast, efficient reload in a narrower, more concealable package. Since making these minor modifications, I have continued to shoot the pistol, using it to teach two DTG Reactive Handgun Fundamentals classes, and have carried it as my EDC, along with the VIP. Round count as of mid-August is just shy of 1000 rounds with zero malfunctions. The new sight setup is point of aim/ point of impact at 10 yards, and about .5” low at 5 yards. I have shot multiple drills, including Dot Torture, the Super Test, the FAST, and the Wilson 5X5. I have been happy with the results, posting some of my best runs. The pistol has proven itself to be reliable and very flat shooting, even more so the faster one shoots. 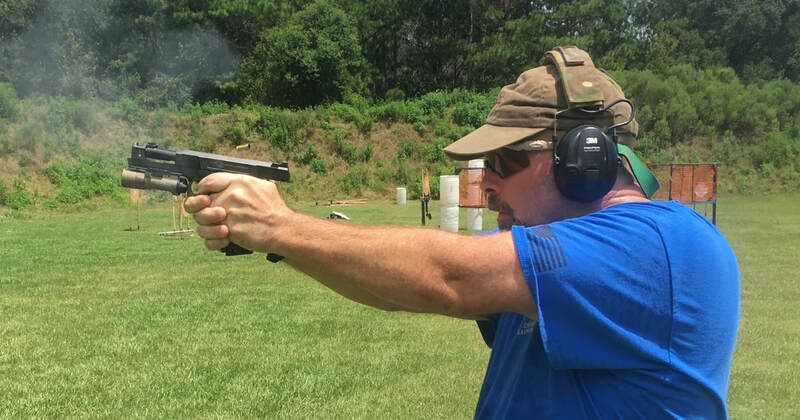 ​A frequently heard criticism of compensated and ported handguns is that, when employed in extreme close quarters situations, gasses and other detritus can potentially be blown up into the face of the shooter, with less than positive effects. Discharge will vary from pistol to pistol and will depend on the type and orientation of the ports as well as the positioning of the gun during firing. However, with the Carry Comp, discharge has been a negligible issue at most. The beard survived just fine. ​When the VIP arrived, I was traveling and unable to get to the range immediately. However, based on my preferences and experience with the Carry Comp, I went ahead with a couple of modifications before live fire. First, as mentioned, I prefer a front night sight and plain black rear sight combination. The VIP comes standard with Heinie Ledge Straight Eight night sights, consisting of a front tritium sight and a rear with a single tritium dot positioned below the notch. I ordered a plain black Heinie Ledge rear sight and swapped it out. Secondly, as with the Carry Comp, there were some sharp edges along the trigger guard that needed to be blended with emery cloth, a process that took less than five minutes. When I got back into town and went to the range, I initially ran 100 rounds through it to check for function. The pistol ran smoothly with no issues. The trigger was similar to that of the Carry Comp, breaking at approximately 4 lbs with minimal take up. 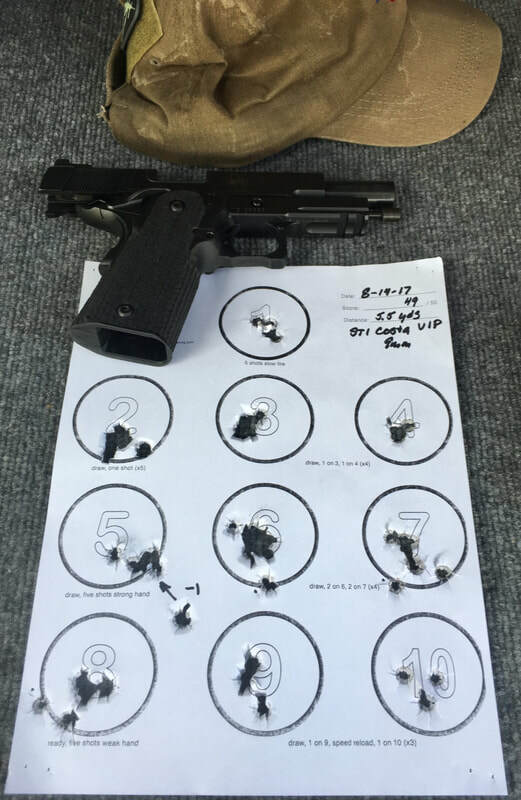 The sights were on at 10 yards and roughly .5” low at 5 yards, comparable to the Carry Comp, which is good for consistency in training. This gun has continued to cycle reliably in subsequent range sessions, although one of the supplied 15 round magazines has failed to lock open when empty on a few occasions. ​The VIP comes standard with an STI short trigger which did not give me the feel that I wanted. I prefer the long trigger that comes with the Carry Comp. I ordered a replacement trigger and, after a short trip to Wizard’s Custom Guns, was swapped out. The longer trigger feels better with my large hands and has a bit more perceptible take up which, as stated, is desirable for a carry gun in my opinion. ​The STI guns differ from a standard 1911 in the profile of the trigger guard and some grip dimensions. This can make finding holsters a bit of a challenge. 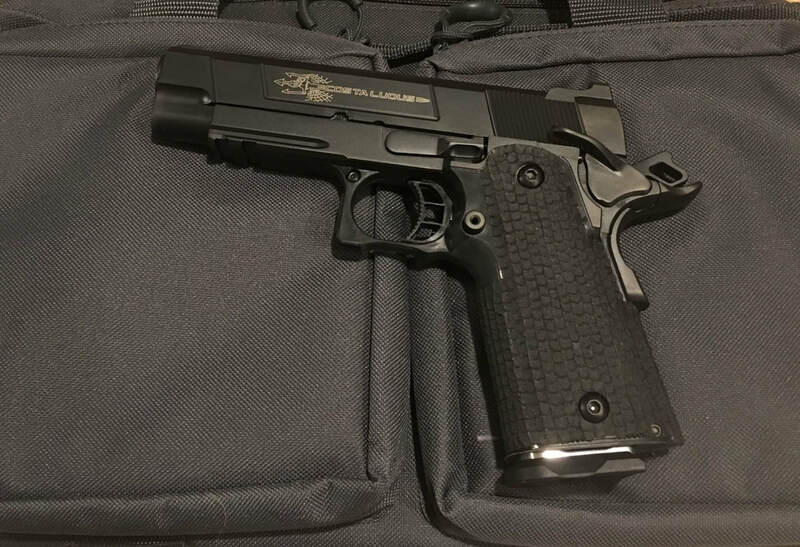 Safariland duty and tactical rigs for a Springfield Operator with weaponlight will fit, as will the Blackhawk Omnivore. I’m currently using a Safariland 6354 on a HSGI warbelt for training. For carry gear, a custom option was needed so I turned to my friend Steve Stamper at PerSecSystems. I ordered several items for both the Carry Comp and the VIP. For everyday carry, I’m partial to the appendix position. I have tried many of the available options and consider the PerSec SPEAR to be the best out there. Carry holsters exist on a sliding scale of concealability verses accessibility. Given why we carry a sidearm, the ability to rapidly and reliably present it is crucial. The SPEAR does a stellar job of tucking the weapon into the wearer but still allows for a solid grip that isn’t buried into the body. I ordered a SPEAR for the Carry Comp with and without a Surefire X300u as well as a SPEAR for the VIP. 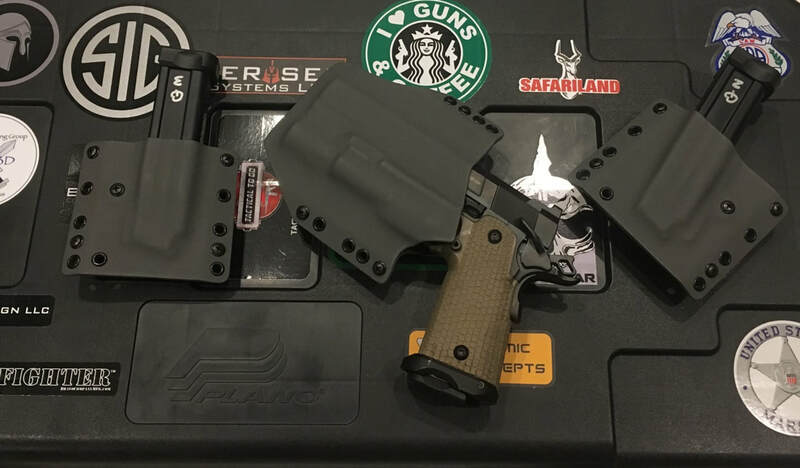 Carrying spare ammo is a must, even with a double stack pistol, so I also had Steve make me his appendix position IWB single magazine carriers, which he calls the MARCC. All of these items were crafted in what has become the unofficial color scheme for DTG – police blue with coyote tan accents. I also asked Steve to make me a SPEAR for the Carry Comp and X300u with an integrated sheath for the American Kami GITFO-T fixed blade that I frequently carry as an additional force option. ​For some types of training and teaching where an outside the waist belt scabbard might be more appropriate, Steve also built me one of his 2nd generation Signature Modular Pancakes and accompanying single mag carriers. This holster is cut to allow more access to one’s front pockets, just making life a bit easier. 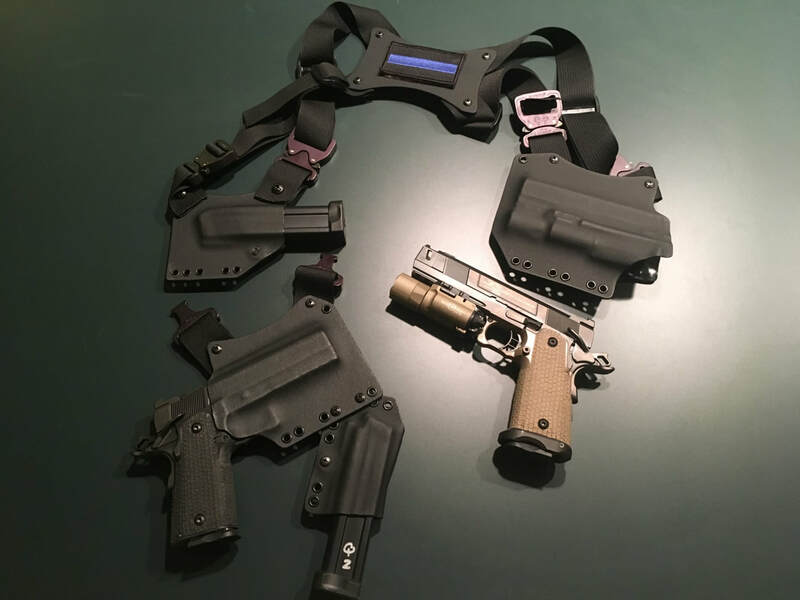 Finally, I had Steve make one of his Sentinel shoulder systems, consisting of shooting side modular holsters for the Carry Comp with and without a Surefire X300u and a support side double mag pouch plus a holster for the VIP with a single mag pouch attached. The system harness attaches to the components using Cobra buckles, making everything quickly reconfigurable. Some may deride the shoulder holster as a lost artifact of the 90s but they still have utility in certain situations. ​So, the big question is – were they worth it? The answer, for me at least, is yes. If you find yourself in a position to acquire one of the STI Costa editions, I don’t think you’ll be dissatisfied. Does this mean you need a $3000 semi-custom 1911 to defend yourself? Of course not - most folks would be better served with a $500 Glock or SIG or Smith and Wesson and $2500 worth of training and ammunition. However, for the shooter who has put in the practice and can appreciate the enhanced performance provided by a finely fit and tuned top shelf handgun, the STI Costa Carry Comp or the STI Costa VIP may be worth checking out.